Why Not Invest in Banksy Right Now? You will hardly find a person interested in street art who has never heard of Banksy. This anonymous British graffiti artist and political activist is perhaps the most controversial street artist who is often called “the most wanted man in the world of art.” After all, no one knows who Banksy is, though everyone knows his satirical works executed in a very distinctive stenciling technique. Not so long ago, Banksy returned to New York after a five-year hiatus, with a whole series of new amazing works across the city. These include a 70-foot-long mural at the corner of Houston Street and the Bowery, honoring the Turkish artist Zehra Dogan, who was imprisoned for painting a damaged Turkish city, and several new Banksy murals painted on the walls of the semi-derelict structures in the Brooklyn neighborhood of Midwood we wrote about in our previous blog posts. Anyway, whether you like the powerful political street art by Banksy or not, the truth is his works are now being sold for millions of dollars at auctions worldwide. The most interesting thing is that the famous artist does not receive money for any of them. Moreover, he does not want his social, political, and humanist messages to be part of commercial art. However, it does not stop lucky owners of various buildings and structures with Banksy murals on them to sell the artist’s works, and they actually have a full right to do that. It is also worth noting that in recent years, Banksy art has become highly desirable among collectors throughout the world, including Christina Aguilera and Angelina Jolie among others. As a result, his works are constantly increasing in value, becoming a good investment. 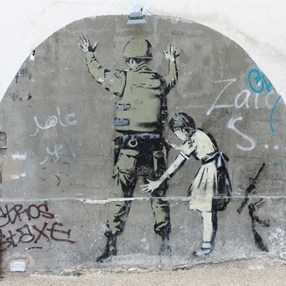 So why not invest in Banksy art right now? After all, even a small work by this elusive artist can eventually bring a sizeable return.